Common #Nutrition Questions Answered: Alcohol; Late Night Noshing; Avoid Fruits and Veggies? Q. I’ve heard that alcohol, especially wine, can be healthy, and I typically have a few drinks during the week as well as two to three each weekend night. Alcohol also impairs a dieter’s good judgment, which means you may eat and drink more than you normally would. To top it off, most people enjoy eating high-calorie, high-sodium snacks when they drink alcohol — that’s triple the trouble if you’re trying to lose weight. From a physiological standpoint, alcohol can cause your blood sugar level to drop more rapidly, which can stimulate your appetite and disrupt your ability to tell when you’ve had enough to eat. Additionally, this effect can cause fatigue, draining your energy level. Alcohol may also interfere with the absorption of certain vitamins and minerals. But if you’re no teetotaler, there are ways to be smart about your alcohol consumption. Next time you’re out for drinks, keep these tips in mind: Stick to beer or wine. Light beer has 100 calories a bottle, compared with 150 for a regular beer. And while 5 ounces of dry wine or champagne will cost you only 100 calories, watch out for sweet dessert wines, which have 226 calories (for 5 ounces). Also, keep track of how many glasses of the wine you have and don’t overdo. Nix high-calorie mixers. Alcohol itself is packed with calories, but when you add mixers — soda, juice, syrup and other ingredients — watch out! Turning rum into a rum and cola almost doubles the calories. So either order spirits on the rocks or ask for seltzer as your mixer. Also note that #diet soda seems to increase the effects of alcohol – so be cautious. Q: Can late-night noshing make you fat? I’ve always heard that you shouldn’t eat after 8 p.m. But I get the worst cravings at night. 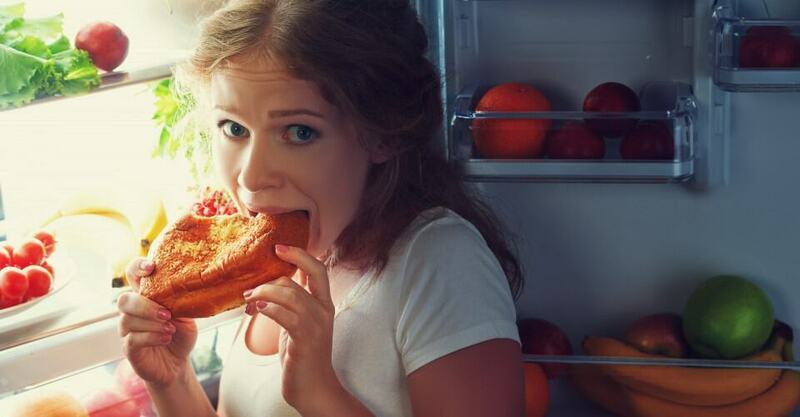 Can I eat late at night, or will it go straight to my hips? A: Many people I talk to assume that whatever they eat late at night will automatically be transformed into fat because they will either be sleeping or inactive for most of the next 10 to 12 hours. When they’re tired and/or stressed, many people find it easier to reach for ice cream, chips and other comfort foods while relaxing in front of the tube. Eating during prime-time TV hours is very common — and often done mindlessly. So what should you do? — Be Prepared: Eating at night in moderation can be OK. In fact, an after-dinner snack is pretty normal. The problem arises when we overdo it and eat a pint of ice cream instead of the half-cup serving the package recommends. To overcome this habit and cut down on your calorie consumption, find a few nighttime Calorie Bargains — lower-calorie substitutions for what you typically eat. Come up with several different low-calorie snacks you enjoy, and keep them readily available. You should create snacks that are about 100 to 200 calories, depending on your daily calorie needs — and make sure to get those high-calorie snacks out of the house. — Pre-Portion Your Snacks: If you don’t want to find substitutes for your favorite snacks, try pre-measuring one serving of your favorite food and eating only that much. Put away any leftovers before you start to eat. Never eat directly out of a bag or box — that’s just asking for trouble! — Snack Consciously: Pay attention to your snacks, especially if you’re eating them in front of the TV, at the movies or in front of your computer. Q: I’m trying to lose weight. Is it true that I should avoid eating lots of fruits and vegetables because they’re high in carbohydrates? A: To give you some background: Sugars, starches and fiber are all members of the nutrient category called carbohydrates and are your body’s main source of fuel. All carbohydrates (fruit, vegetables, breads and dairy products) contain some natural sugar. For example, fruits and vegetables contain fructose and glucose, milk contains lactose, and grains contain chains of glucose linked together. Because the sugar in fruits and vegetables occurs naturally and is combined with many beneficial vitamins, minerals and other disease-fighting compounds, the pros of including these foods in your diet definitely outweigh the cons. Even with their sugar content, fruits and vegetables aren’t likely to prevent weight loss — in fact, they can have the opposite effect. These foods are nutrient dense, which means they’re low in calories but high in the good stuff. They’re also rich in fiber and water, so they help you stay full longer. Since weight loss requires that you take in fewer calories than you expend, fruits and vegetables are ideal for helping you stay satisfied while sticking to a weight-loss plan. Also, you might want to separate fruits and vegetables – yes, they can both be healthy, but they are not the same. Fruits typically are higher in sugar than vegetables, and vegetables are generally lower in calories on a per-gram basis. Don’t get me wrong, fruits are still an important part of your diet, but you should not consider fruit a free food. Most non-starchy vegetables (e.g. broccoli, cauliflower, peppers, celery, etc. ), on the other hand, are very low in calories and sugar, and you can usually eat as much of them as you like without worrying about your weight.